L-Arginine is an important amino acid that plays many roles in the body. 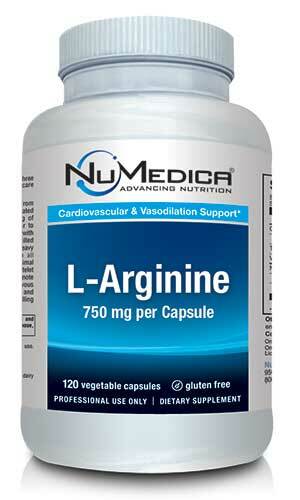 NuMedica L-Arginine provides the body with this integral amino acid that is involved in a myriad of health processes. L-Arginine provides support for the immune system so it can more effectively ward off illness and disease. The amino acid is also involved in wound healing, cell division, the secretion of hormones, and the removal of ammonia from the body. 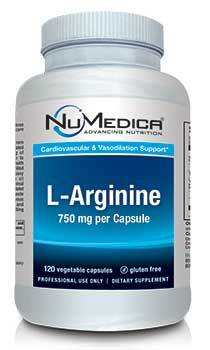 Many people take NuMedica L-Arginine to ensure that they are getting an optimum amount of this amino acid. While L-arginine can be obtained from a variety of foods, it may not be enough to support optimum health. For instance, if you have an infection or injury, your L-arginine is needed to help combat this stress, so you need to ensure that you're getting even more of this amino acid. Chronic illness will also deplete your store of L-arginine. A supplement like NuMedica L-Arginine ensures that your body is getting enough of this amino acid to support overall health. While L-arginine is a well-known support for the immune system, researchers believe it may also support cardiovascular health and continues to be investigated as a reliable treatment for cardiovascular-related issues. There is some evidence that suggests L-arginine could help prevent congestive heart failure, high blood pressure, and pain resulting from blocked arteries. Researchers also believe L-arginine may support female reproductive health and could help decrease symptoms associated with erectile dysfunction in males. In addition, this amino acid has been used to help treat migraine headaches and wound healing associated with diabetes. Directions: Adults take two capsules twice daily with meals or as directed by your healthcare practitioner.